Indecipherable. Poor handwriting is a classic reason why mail ends up at the dead letter office. "We used to be called the dead letter office. But now it's the mail redistribution centre (MRC) - it sounds not so dead," said Tatiana Rumora-Lucic, with a smile. It's eight working days before Christmas and in a quiet corner of a nondescript facility in an industrial area of southern Sydney, work is cranking up. Metal cages are being wheeled into the office. They are filled with letters, Christmas cards and parcels likely full of festive gifts. All have one thing in common - for one reason or another they haven't made it to their intended destination. Ms Rumora-Lucic is the manager of the MRC, the librarian of lost letters if you like. 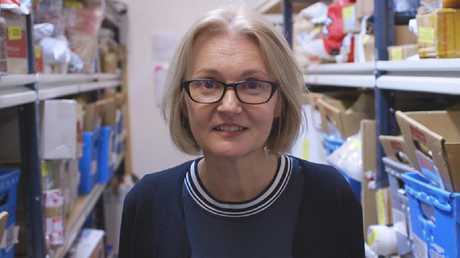 It's the job of her and a team of 14 to find out who owns the missing items - they're Australia Post's mail detectives. "Our mission to reunite the mail with their owners and to protect the integrity and confidentiality of the mail. And were pretty good at that," she told news.com.au. Tatiana Rumora-Lucic, who runs Australia Post’s Mail Redistribution Centre in Sydney. her job is to reunite missing mail with its owners. Picture: news.com.au. 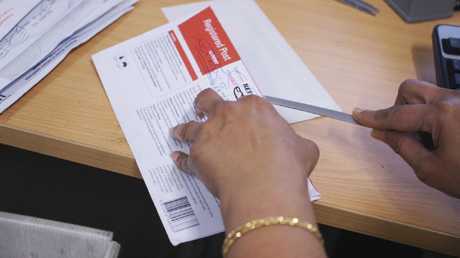 Every day the MRC receives thousands of pieces of undeliverable mail from New South Wales, Queensland and the ACT. In the brightly lit office, staff deftly slice open envelopes with letter openers and interrogate the internet to work out where the mail they're holding should really be. Some of the challenges might seem insurmountable. Ms Rumora-Lucic, who has been getting lost mail moving again for 18 years, points towards a white padded envelope: "This came without any address at all, we see too many of those." Inside were perfume samples but no hint whatsoever as to who sent or who it was for. "We couldn't fix it," she said sadly. 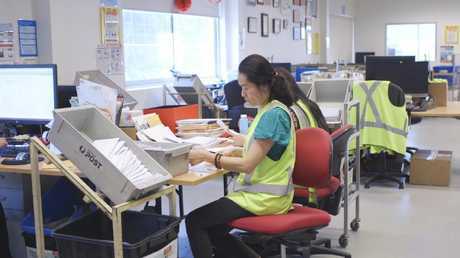 Every year 650,000 pieces of missing mail arrive at Sydney’s dead letter office, which processes all missing mail from NSW, Queensland and the ACT. But an equally head scratching puzzle had a better outcome. 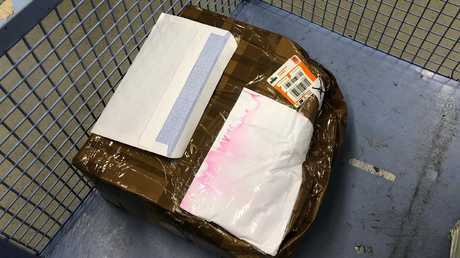 A large brown parcel had a piece of white paper fixed to the front. Left out in the rain, the address had utterly washed away; all that remained was a pink soggy blur. 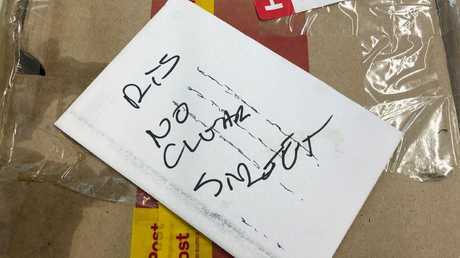 "This parcel had water damage and so no address. But it had a postal label and bar code from the UK. If we had been unable to find the customer we could have sent it back to the UK but a customer had already been in touch saying they were expecting a Christmas gift." By comparing the barcode quoted by the customer with that on the parcel they were able to confirm it was indeed destined for them. With a fresh, and water resistant address label, it will make it to the family in time for Christmas. On an average day some 2500 lost letters and parcels arrive at the office - that figure can double at Christmas. Ms Rumora-Lucic said they manage to solve the riddle of who the package belongs to in 70 per cent of cases. The original address on this envelope was indecipherable. In a store room is rack upon rack of homeless post, waiting for customers to get in touch or for the staff to work out who they belong to. The bottom shelf looks like check in at an airport with row upon row of suitcases. Except none, yet, have made it to their destination. "Every time you have someone's luggage I imagine the stress people are going through because I know how important it is. But people are not aware that (address) labels don't stick to luggage - if you have a smooth surface they just come off." The most common issues include envelopes where the address is indecipherable, the receiver has moved home or the sender has left out key information, like a street number, or just got the suburb name completely garbled. "We see this on a daily basis," she said motioning toward what, on first glance, looked like a reasonably addressed envelope. Inside was $50 and a greeting card. "It looks like it says Durston Street but there's no Durston Street in that suburb. You can see from the handwriting it is on older person straight away." The team looked for similar sounding streets in the same suburb and happened upon one called Burton. Using the White Pages they then found a family with the same name. "I made a call and she said 'oh my word, I've been waiting for this birthday card'. She said she knew the relative hadn't addressed it properly but they thought they'd never see it again. "Those kind of things are so rewarding." The mail detectives look for clues as to who the piece of mail belongs to. Sometimes, the mail detectives don't even need to open the letters. If there's a company name on the package they can often phone them and get it back on its way. But, more often than not, staff have to rummage around inside. 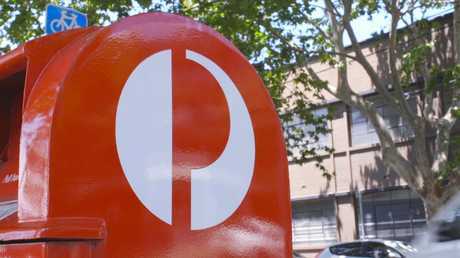 "We are the only people in Australia Post authorised to open people's mail; it's just Customs and us," said Ms Rumora-Lucic. "We look inside for clues, so whether they have a return address or a phone number." They also make a list of some of the items in the parcel or the suitcase: "What we are looking for is things a customer will most likely say is in the package. So, black socks no, but a Gucci bag - they will mention that for sure." Ms Rumora-Lucic said she had found some bizarre things when rifling through other people's post. "You have to be careful, you never know what's in there. I've seen fog making machines, war medals, armour for knights - even live animals. We found a gecko that someone wanted to smuggle overseas to sell." Tatiana Rumora-Lucic in the store room where thousands of missing items are stored. Having the correct address and packing an item properly is the best defence against your item languishing in the MRC. But there were other tips to speed you mail's journey, she said. 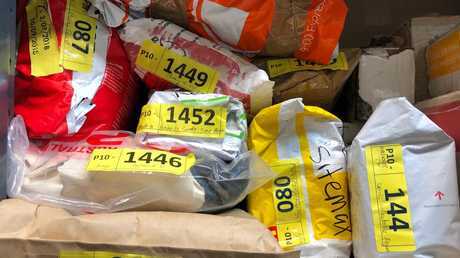 "If it is traceable and has a barcode then the chance of retrieval is 100 per cent increased." A return address also means that, at the very least, the sender will get the package back. A phone number on the item is even better because then the team can then easily work out where it should be. 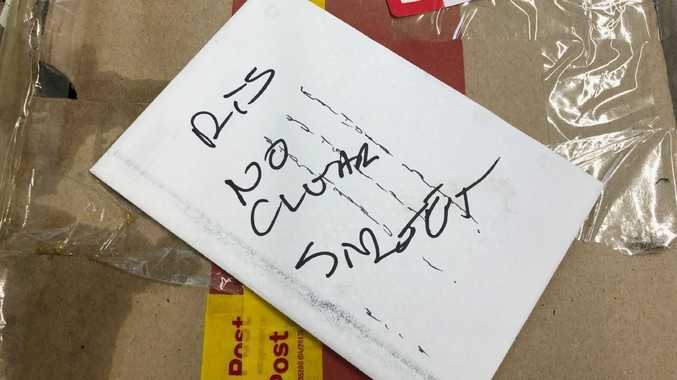 And if you are expecting some mail that has taken too long to appear, give Australia Post a call, she said. 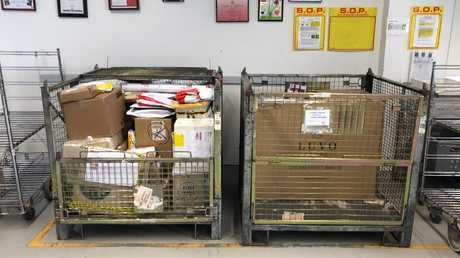 It's one of the main ways they get the packages out of postal purgatory. If the owner is found, they reseal the envelopes, repack the parcels and put them back in the system. "I'm very good at wrapping Christmas presents, I feel like I do it 365 days of the year," she said. But despite all the rummaging and cataloguing, inevitably, the rightful owners of some items are never found. "We store them for two months or one year in the case of cash or jewellery. "Some of the items will then go to the Salvation Army and we auction items off. 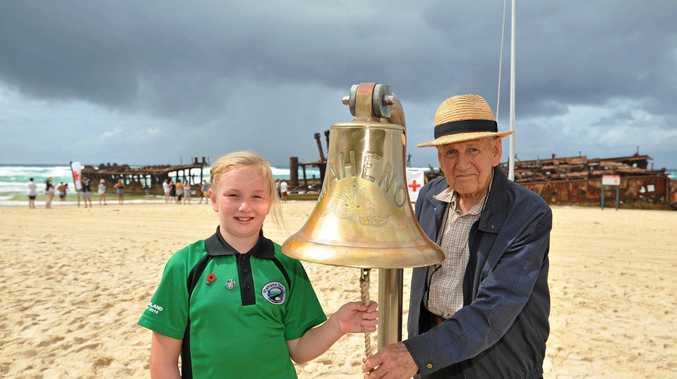 The money raised goes back to the community through various Australia Post grants. Over the last ten years we raised almost $1 million," she said. But for Ms Rumora-Lucic, this is a bitter sweet ending: "It's so sad when you can't reunite people with their mail, but we do everything we can. "It means a lot to us, it's personal, what you're doing makes a difference to people. "People don't know how much work is involved. And all that for a one-dollar stamp. " The silence of the store room is shattered by the squeals of a metal cage, bringing in another delivery of dead letters ready for the mail detectives to start sleuthing once more. Cages, full of missing mail are brought in every day. The address on this label washed away in the rain. The team still managed to find out who it belonged to and post it on. 70 per cent of the items are reunited with their owners. Postal purgatory: Each items has, at a minimum, two months before it is donated to charity or auctioned off.